1) Have a Christmas movie night. My kids love the Mickey’s Once Upon a Christmas and Twice Upon a Christmas Movies. What are your family favorites? Comment below or tweet me! I would love to check them out! 2) Bake cookies. We like to bake sugar cookies, use a house shaped cookie cutter and paint them like gingerbread houses. I haven’t actually attempted traditional christmas cookies with the kiddos yet…I have a couple of blogging besties that are definitely giving me the inspiration to do so though. Mama by Fire, Ruffles and Rain Boots and Parenting From the Heart have some pictures that leave my mouth watering. 4) Go for a Christmas light drive. One of my favorite family traditions as a child was to go for a drive in our small town, through neighborhoods, and look at how the different houses were decorated for Christmas with Christmas music playing on the radio. I plan on continuing this tradition with my children. 5) Sing Christmas carols. I think I will count on YouTube for this one, my kids would much rather learn a song from the computer than from me, should I be admitting that?? 6) Make homemade ornaments. We have done I-Spy one and melted crayon ones in the past that I LOVE. My kids love making homemade ornaments, we are always looking for inspiration, again, comment below or tweet me with your ideas! 7) Make Christmas cards. I always print out or order the cute christmas cards and then never mail them…they are probably in the same stack as the birth announcements from the last three kids…so we are always last-minute making some for some set of Grandparents it seems! 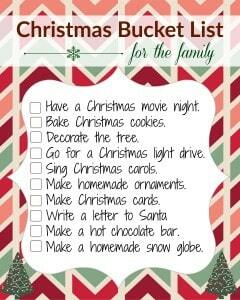 8) Write a letter to Santa. This is a MUST, isn’t it? If you are in the States, and want one mailed back to your child FROM Santa, read how here. 9) Make a hot chocolate bar. We love hot chocolate around here, I was thinking of making it a fancy treat one night with chocolate spoons, candy cane stirrers, sprinkles, whipped cream…the possibilities are endless. 10) Make a homemade snow globe. I love how these look and how personalized they can be. A would LOVE the My Little Pony one! I’m not sure if we will do a photo one, or one with a trinket yet, but I’m sure we will come up with something fun! 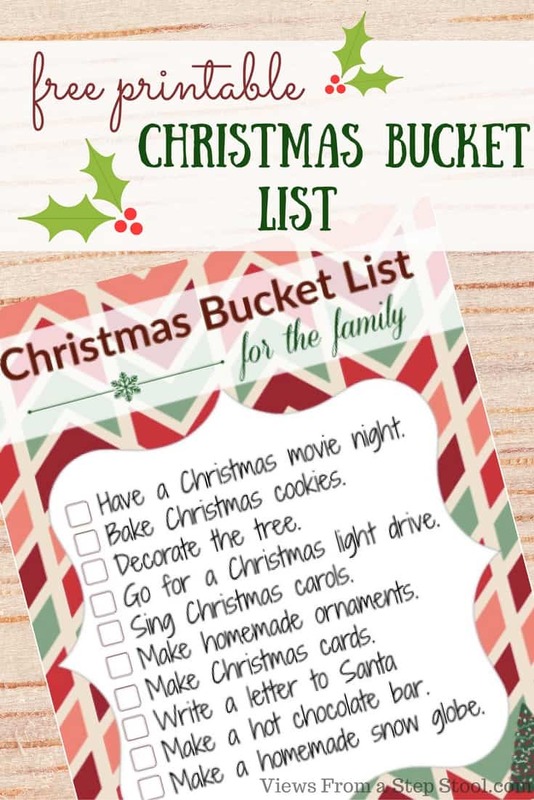 What’s on your family’s bucket list for the holidays? I love this list! We love the Christmas Lights Drive too! There are certain houses we can’t miss! Also, the hot cocoa bar idea is genius! I know it’s old school but we still watch Miracle on 34th Street. Have a blessed holiday season! oh thats a great one! Im sure my son would love it, I’ll have to show it to him. Thanks! 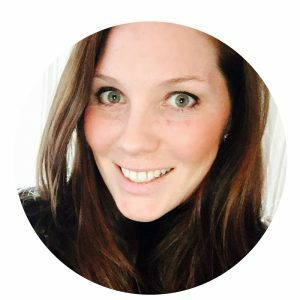 I love your list! I have a lot of the same things on mine! I just want you to know, that I officially let go of all control over how the tree is decorated. My daughter is so incredibly proud of herself!! And I’m proud of her too! I love this list. I’m definitely printing this out. My favorite Christmas movie…hmmm. It’s either The Muppet Christmas Carol or The Nutcracker Ballet. Caleb is not really into movies yet, but I can’t wait until he is. I dream about family movie nights. It’s the little things. I love the hot chocolate bar idea! I can see my kids totally getting into that. I hope you’re able to check everything off your list this month!